Select Calculate Shipping on the shopping cart page. Select your Country, State/Province, and enter your Zip/Postal Code. The shipping calculator on the Cart page should give you a good estimate of shipping cost before checkout. Keep in mind – UPS does not always show a shipping cost until they have your full address. Several kits we sell are over 4ft long. Mini Channel Kits are 6ft long. Micro Channel Kits are 5ft long. Cast iron and bronze grates are HEAVY. Our 5″ driveway drainage cast iron grates weigh approximately 10lbs. each! Many times we need to ship your order in multiple boxes – especially heavy grates. This also increases shipping costs. We try to keep the weight of our boxes under 60lbs. All orders over $1000 will require a signature. We are not responsible for orders in which the customer has waived signature. Lost or stolen orders are solely the responsibility of the customer. Delivery times will vary based on the size of the order and distance from our warehouse to your home or job site. If not in stock, Baked on oil finish (BooF) grates may take 2-3 weeks to ship due to the time needed for the BooF process. How do you pack and ship my order? We have a variety of package and freight carriers we work with. The size of your order will dictate which carrier we use. Some orders may take several boxes due to the size or weight of what you purchased. Weight and Dimensions shown under the Additional Information tab on any product are for shipping purposes – not actual product specifications. 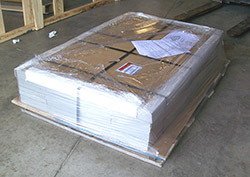 We pack your order in the best manner to assure safe delivery to your home or job site. DrainageKits.com charges a 25% restocking fee on all returned orders. Due to time and cost, additional charges for custom fabrications, channel miter cuts, non-standard grating finishes and shipping cannot be refunded. To request a RMA number (return merchandise authorization), please contact us. We will need your order number and the reason you are returning your order. Any returned orders without an RMA will be refused. NO RETURNS accepted after 30 days from date of purchase. CLOSEOUT SPECIALS, such as the Jonite grates, cannot be returned. We do our very best when packing your order to assure it arrives safely. You are responsible for inspecting orders upon delivery. Any items that are signed for as received in good condition, and then later reported as short or damaged, will not be eligible for a refund. Accept the shipment. Do not refuse or return it. Note the damage on the delivery receipt (if shipped by truck) or with the driver (for UPS/FedEx parcels). Keep a copy of the document with the damage noted. If you think there is damage, but cannot tell how much, write a note such as “1 box crushed, damage subject to further inspection”. Take photos of the pallet/box before unpacking it. Keep all boxes and packing materials until the claim is settled, they may be needed for an inspection. Contact DrainageKits.com with the details of the damage within 48 hours. DrainageKits.com will file a damage claim on the customer’s behalf. Wrong shipment or incorrect items: All wrong shipments or incorrect items must be reported to DrainageKits.com within two (2) business days (48 hours) of delivery. Customer Service will arrange for pick-up of goods from customer. All incorrect items will be corrected to customer specifications. We reuse shipping materials whenever possible.